Glenrothes - Speyside destilleri fra 1878. Har taget navn efter byen Rothes, og har altså intet at gøre med byen Glenrothes som ligger i den modsatte ende af højlandet. Glenrothes indgår som en vigtig del af Cutty Sark blend og den bedst sælgende whisky i Skotland, Famous Grouse. Der findes en række originalaftapninger, og en del uafhængige aftapninger også. True in style to the very crisp and winey style of the distillery, this is a textbook Glenrothes. Nuts, dried apricots and peaches, with a touch of raisins and a biscuity background (but never straying from its essentially dry character) are the most immediately recognizable aromas. The influence of dry, nutty and fruity Oloroso sherry remains subtle, without overwhelming the distillate but on the contrary integrating and amplifying its original aromatic profile. The finale is lingering and raisiny, but still dry. A drop of water will make the flavours easier on the palate, taming its dryness, while still preserving the robust mouthfeel. 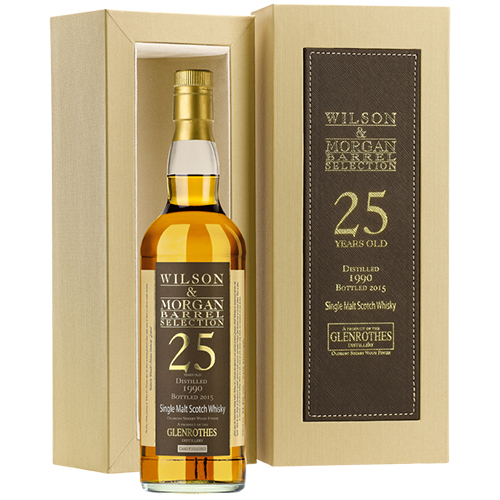 A Special Release at cask strength for connoisseurs.